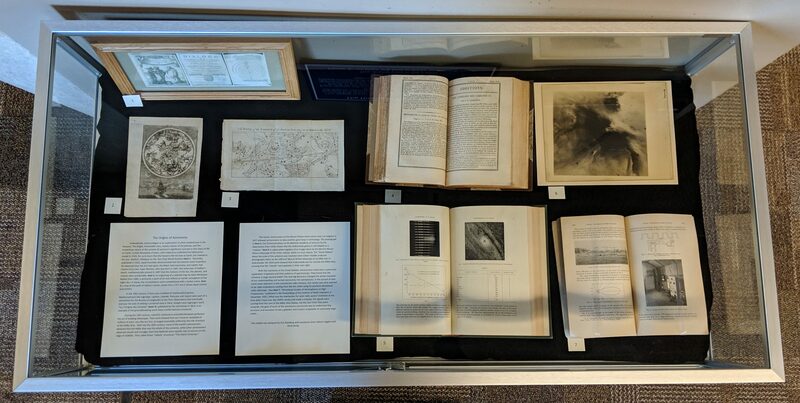 Fermilab scientist Erik Ramberg and the Fermilab Archives present a new exhibit, “The Origins of Astronomy,” as part of their series on the history of physics in print. The exhibit can be viewed in the glass display case through the end of April in the Fermilab Art Gallery, which is open Monday through Friday, 8 a.m. to 4:30 p.m. The exhibit showcases written publications, images, and works of art that reflect scientific and conceptual understandings of the night sky over four centuries, from a 1685 engraving of a celestial map by Alain Manesson Mallet to Karl Jansky’s 1932 findings on directional radio astronomy. Science began as an explanation of what mankind saw in the heavens. The bright, immovable stars, stately motion of the planets, and the mysterious nature of the comets all seemed in significant contrast to the chaos of life on Earth. It took thousands of years to get to Copernicus, and hundreds more to get to our understanding of large-scale heavenly bodies. Astronomers still strive to understand the structure and evolution of stars, galaxies and clusters of galaxies. See how we got to where we are by learning about some of astronomy’s most influential works. This exhibit was designed by Erik Ramberg with assistance from Valerie Higgins and Karin Kemp.